The first video arrives by email. An unidentifed man. A naked woman. Her scream caught in a freeze-frame. The producers of TV’s Crime Seen! can’t believe what they’re witnessing—an all-out sadist “auditioning” for a starring role in reality television. And if he doesn’t get it, he’ll kill again. To meet the demented demands of the self-proclaimed “Don Juan,” former sheriff and TV host J.C. Harrow has no choice but to spotlight him along with another ruthless maniac who has captivated millions of viewers. Now two killers are locked in a bloodthirsty competition. For fame. For notoriety. For victims. 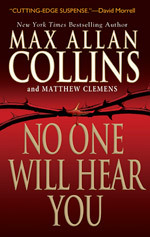 Somebody Dies: a "fascinating new side to Max Allan Collins...Collins and Clemens expand on the potential of their first J.C. Harrow book and produce what may become a classic of the serial-killer genre, continuing plot threads begun in You Can't Stop Me while solidly standing on alone in its cleverness and originality." Bill Crider's Pop Culture Magazine: "...a highly entertaining package that's guaranteed to keep you turning pages past your bedtime." Kindle Taproom: "The characters (whether good or bad) have depth and complexity; the pacing and action start with high energy right out of the box and then intensify; and the many scary scenarios are, well…very scary.…Here’s hoping for more J.C. Harrow and company in the near future." Not The Baseball Pitcher: On the JC Harrow series so far: "Two fine novels from folks I’ve learned to trust. Worth a look." Harriet Klausner: "an exciting serial killer thriller"